StarMicronics has the winning combination for the Banking Industry, integrated both receipt printer and check scanning in very small footprint conserving valuable teller counter space. 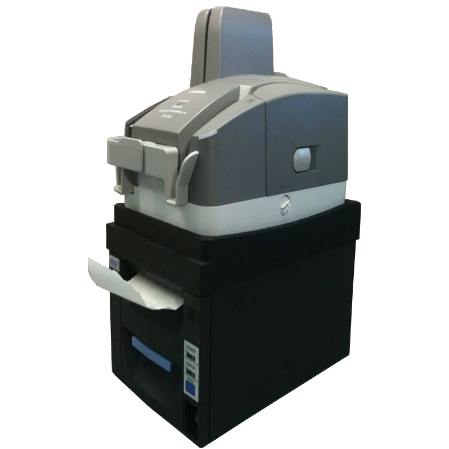 Designed specifically for use in bank and credit union branches, the FVP-10 platform-top cover accessory holds check scanner devices securely in place atop the printer. This allows financial institutions to use their FVP-10 printer to generate customer receipts for check deposits while simultaneously scanning those same checks with check transport equipment - all in a single step rather than two consecutive steps. Current Platform Accessories available for Canon, CTS, and Panini brand check scanners, additional brands in development.